I found this meme over at a friend’s blog, Seaside Simplicity. She inspired the topic for today’s Round Robin Photo Challenge for Saturday, January 26th – Long Ago, Far Away – so I’ decided to join the fun. Here is your chance to get all nostalgic, photographically! Maybe it’s a photo you took with your first, cheap camera when you were 12 years old. Maybe it’s a photo you just took of a person, place or thing from your childhood. Maybe it’s something from longer ago or farther away than that: a castle or cathedral you photographed on a trip overseas, a dinosaur skeleton, or a distant constellation of stars, the light from which has taken years to reach us. If it was long ago or far away or both, it counts! All I ask is that it be a photo you took yourself, whether it was 40 years ago or five minutes ago. Happy times! This is my aunt who recently passed with me and her daughter Jenn at one of our favorite places, Galveston Island. All our lives Jenn and I would go down there and collect shells off the beach. It isn’t that easy these days with the weird growth along the shore line, but back then we would walk on the sea wall, collect shells from the water’s edge and just basque in the winter sun. You can’t see it in this picture, but we’re barefoot! LOL I’m holding my socks. I also still have every shell that I ever collected and keep them in a crystal bowl. Sharon had Parkinsons disease. Her mobility continued to go downhill from here so this is the last picture I have of us having fun. Thank goodness for tripods and timers so we could all be in the picture together. I found this over at a friend’s blog, Martha at Seaside Simplicity. She inspired the topic for today’s Round Robin Photo Challenge for Saturday, January 26th – Long Ago, Far Away – so I’ decided to join the fun. Happy times! 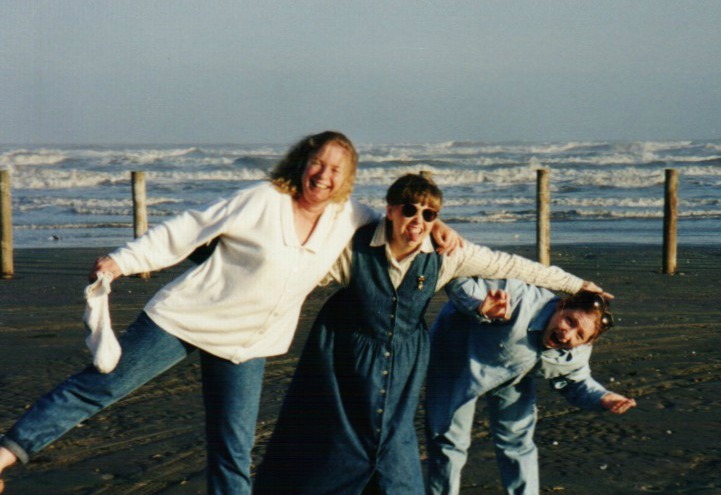 This is my aunt who recently passed with me and her daughter Jenn at one of our favorite places, Galveston Island. All our lives Jenn and I would go down there and collect shells off the beach. It isn’t that easy these days with the weird growth along the shore line, but back then we walk on the sea wall, collect shells from the water’s edge and just basque in the winter water. You can’t see it in this pictures, but we’re barefoot LOL I’m holding my socks. I also still have every shell that I keep in a crystal bowl. Sharon had Parkinsons disease. Her mobility continued to go downhill from here so this is the last picture I have of us having fun. Thank goodness for tripods and timers so we could all be in the picture together.